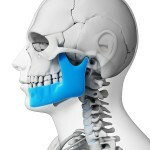 Temporomandibular joint disorders (TMDs) are estimated to affect around 30% of adults at some point. A range of non-surgical approaches to treatment have been explored; physical therapy, pharmacotherapy, occlusal splints and low-level laser therapy (LLLT). The aim of this review was to evaluate the effectiveness of LLLT for patients suffering from TMDs. Searches were conducted in the Medline, Embase, and Cochrane databases and Goggle scholar. Only randomised controlled trials (RCTs) published in English comparing LLLT with placebo in patients suffering from TMDs were considered. Two reviewers independently selected studies assessed study quality and abstracted data. Study quality was assesses using the modified Jadad scale. Outcomes of interests were the visual analogue scale (VAS) scores (at the final follow-up time point), the change of VAS scores and TMJ function was assessed in terms of maximum active vertical opening (MAVO), maximum passive vertical opening (MPVO), protrusion excursion (PE) and right and left lateral excursion (RLE and LLE, respectively). This study indicates that using LLLT has limited efficacy in reducing pain in patients with TMDs. However, LLLT can significantly improve the functional outcomes of patients with TMDs. More future studies are needed to provide robust evidence and precisely determine optimal treatment procedures for LLLT in TMDs. We have previously reported on two earlier reviews that have looked at the effectiveness of LLLT on TMDs (see Dental Elf 6th Oct 2014). This current review includes that largest number of RCTs. However the authors do highlight a high degree of heterogeneity between the studies and highlight a lack of definition of the used dose and energy density in several studies. The also note poor levels of description of randomisation and blinding in the included studies which raises the issue of the quality assessment of the studies. The authors used the Jadad Scale, which uses a simple numerical scoring system, and the Cochrane Collaboration does not recommend this type of approach. If the preferred Cochrane Risk of bias approach had been used it is most likely that fewer of the studies would have been considered of high quality. Consequently the results of this review should be interpreted with caution. Chen J, Huang Z, Ge M, Gao M. Efficacy of low-level laser therapy in the treatment of TMDs: a meta-analysis of 14 randomised controlled trials. J Oral Rehabil. 2014 Dec 9. doi: 10.1111/joor.12258. [Epub ahead of print] PubMed PMID: 25491183. Though there are mixed reviews on LLLTs, we have over 100 dentists in USA and CANADA using MLS dental laser, a diode pain treatment laser that is showing incredible pain reduction for craniofacial disorders, as well as speeding up Ortho Tx times, and also for muscle relaxation prior to bite registrations. Definitely a move in the right direction on what LLLTs have established! While the view of dentists and perceptions of dentists are interesting they do not represent robust evidence of whether a therapy is of value or not! The only way to truly identify whether LLLTs offer real benefit to patients to conduct high quality randomised controlled trials.